When you have no words, let this delightful pendant speak for you. 0.20 Carat t.w. Brilliant Round Cut Diamonds with bold Baguettes join together for one fabulous look! Masterfully crafted in 10 Karat white gold, these Diamonds form an open heart perfectly accented with alternating rounds and baguettes forming a flirtatious open-worked criss cross pattern. 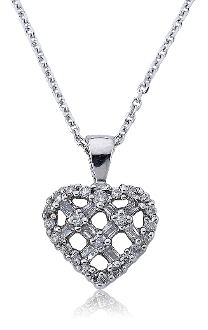 A grand look, this sweet waffle style pendant comes complete with a highly polished 14 Karat white gold 16 inch cable chain that secures with a lobster claw clasp.